Eggnog, another classic Christmas flavor! Do you like eggnog? I didn't when I was a kid, but that's probably because I was afraid to try it. I assumed with a name like eggnog, it was probably nothing but raw eggs and a little milk. Man, did I miss out! Ever since I tried it, I've pretty much become an eggnog addict. 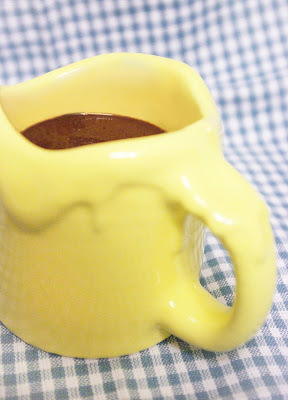 I first tried a chocolate eggnog by simply adding chocolate syrup to a full glass. It's great like that! 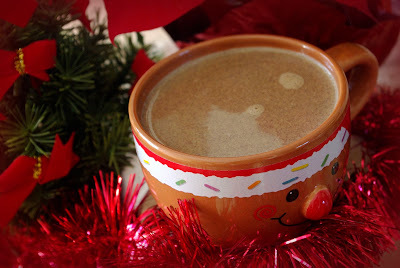 Naturally, at Christmas, I had to come up with a simple, delicious hot chocolate that lets the flavor of the eggnog really come through. I think I did pretty good, but you'll have to try it for yourself and let me know! 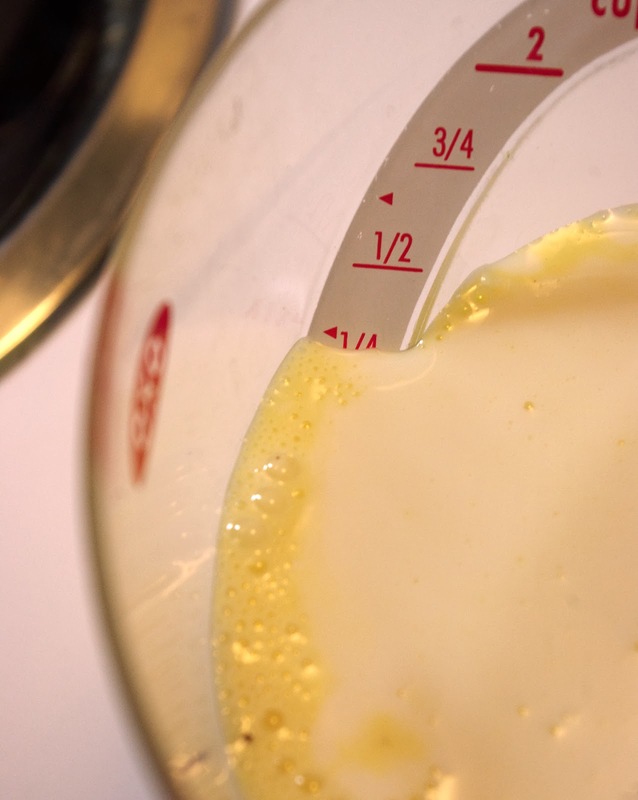 If you've never dared to try it, eggnog is really thick, incredibly creamy, and very sweet. It tastes of vanilla and spices, mainly nutmeg. Every glass is like its own little serving of dessert. We only need a few things for our eggnog hot chocolate. 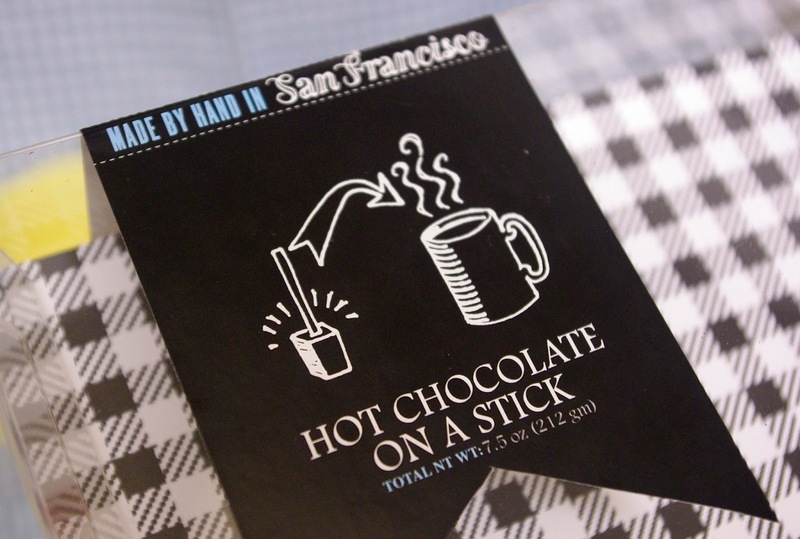 99% chocolate (or 100%, also known as baking chocolate) is another thing that fooled me when I was a kid. The package says chocolate, and it sure looks like chocolate. But taste it. It's bitter and strong, very much like cocoa powder. It has no sugar or sweetener of any kind, so it's very unpleasant. 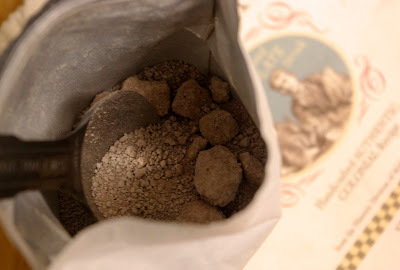 In fact, it's pretty much cocoa mass, or cocoa liquor, which is simply the ground cacao beans. In this case, it's ground and refined just like regular eating chocolate, but no sweetener is ever added. It's different from cocoa powder in that the cocoa butter from the bean has been completely retained. In cocoa powder, the butter is pressed out. The Scharffen Berger chocolate I'm using is 99% because they added a tiny bit of vanilla when they made it. Chop that chocolate up small, like we always do on this blog. 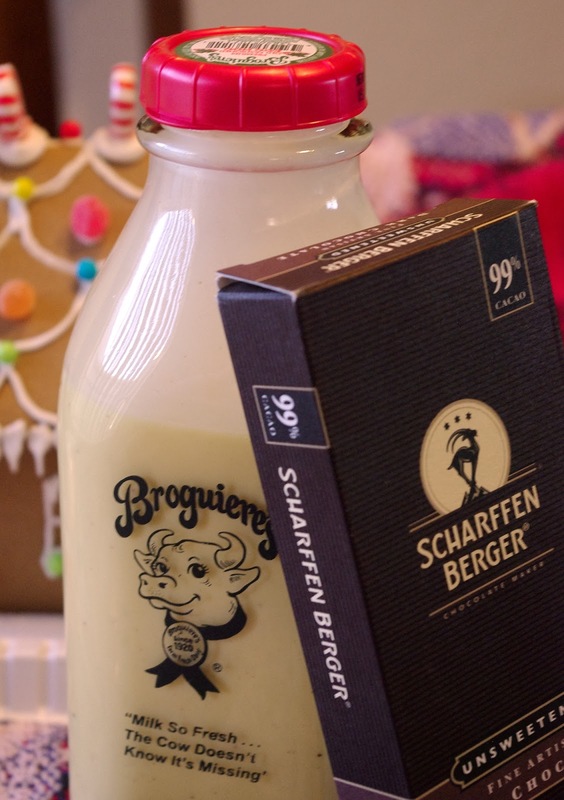 I'm using eggnog from Broguiere's Farm Fresh Dairy, which is a great local Southern California dairy. Their eggnog is thick, creamy, and amazing! So rich! And they still use glass bottles, which is great. Ok, let's get busy! We're going to thin out the eggnog a tiny bit by adding milk to it. 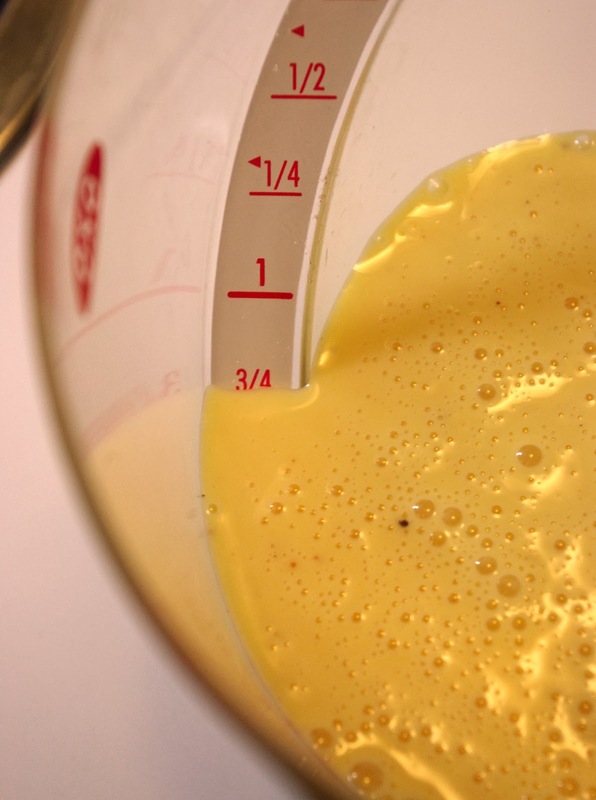 Grab a measuring cup that holds at least 2 cups and fill it up to ¾ with eggnog. Then add milk until the level reaches 1¼. Of course, you can adjust this ratio to your liking, but this is a good starting point. Put into a saucepan on the stove top, set the heat to medium. Don't let it boil, but get it as close as you can. 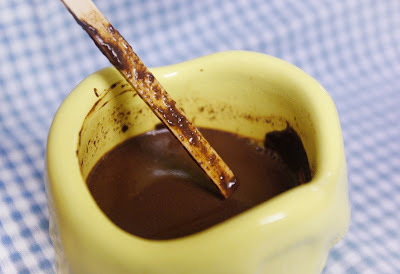 Once it's nice and hot, add in the chocolate and whisk until it's completely melted. Then turn off the heat and add the vanilla. Traditionally, eggnog is served with grated nutmeg on top. 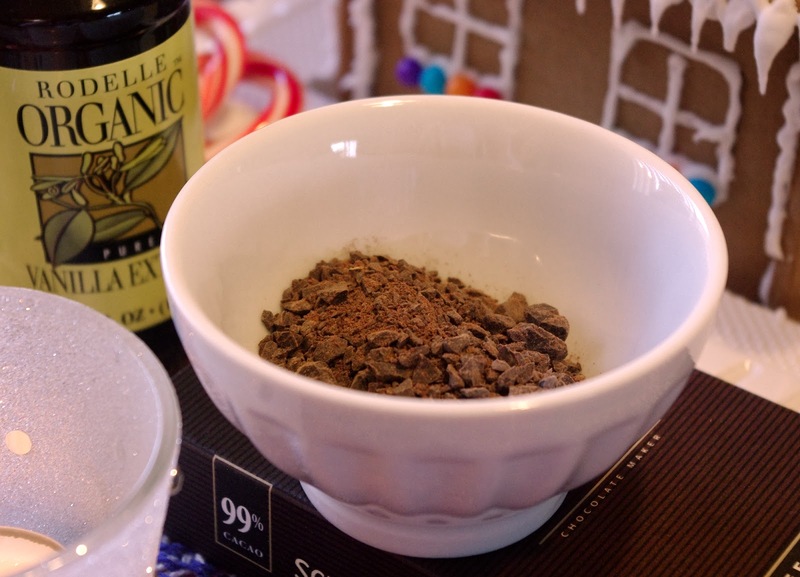 Once our hot chocolate is in the mug, top it with whipped cream, then sprinkle nutmeg on top! Perfect! 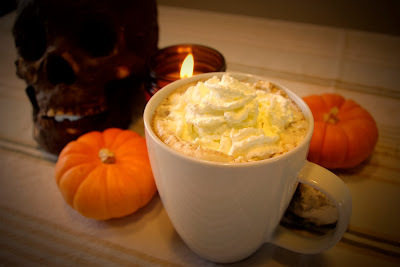 Or, even better, if you happen to be making your own fresh whipped cream, add nutmeg into the cream before you beat it. 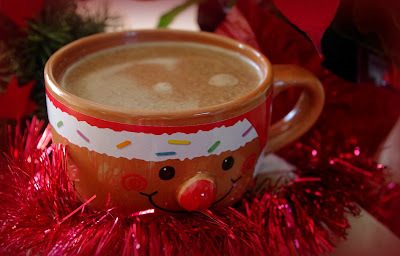 If this isn't the perfect Christmas comforting drink, I don't know what is! December, finally! It's the time of year when everyone pays attention to hot chocolate! 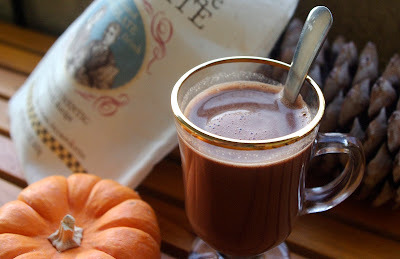 While I continue on in my effort to make hot chocolate accepted as a year-round beverage, I can't help but get a little extra excited about this time of year. I've got some absolutely amazing hot chocolates lined up for the next few weeks, with flavors that are distinctly in the holiday spirit. And the first one is gingerbread. Gingerbread houses, gingerbread man cookies... Mmm... 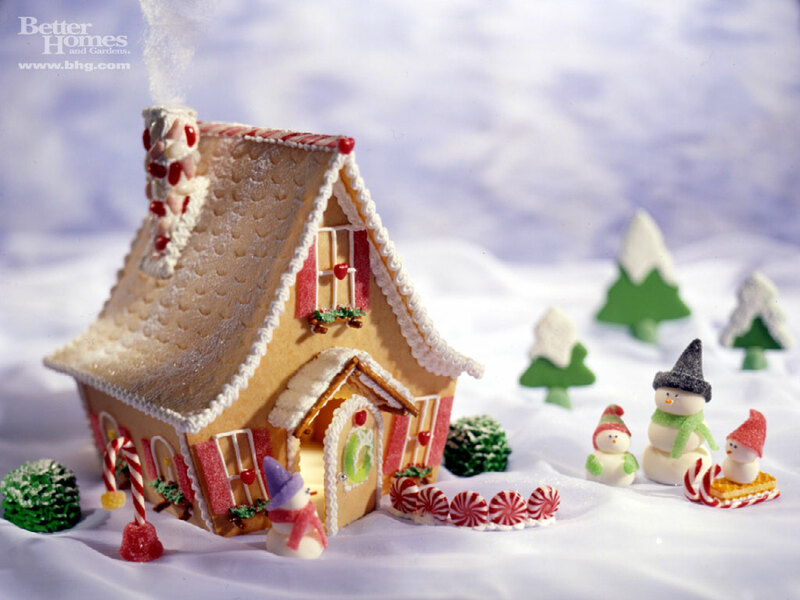 Gingerbread just has that flavor that stirs up wonderful memories from when I was a kid. Capturing the gingerbread flavor was an interesting and fun process. I researched what spices and flavors actually create that specific flavor of gingerbread cookies. 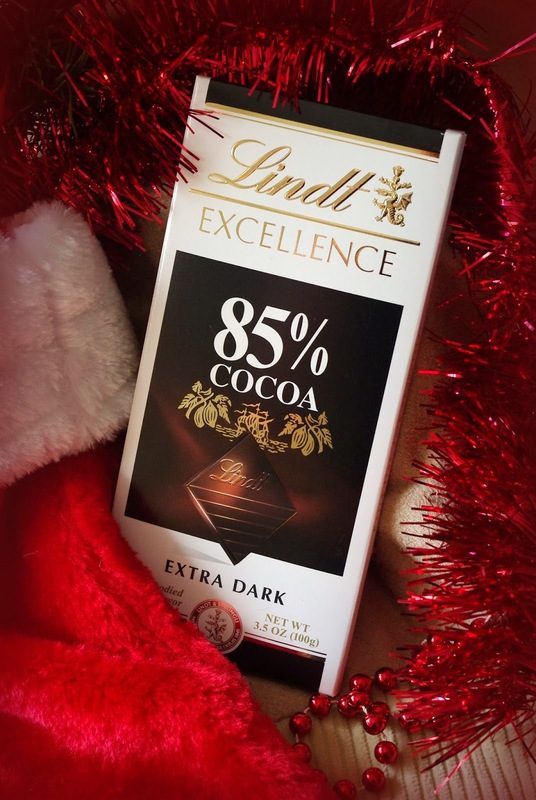 Once I had it, finding the right combination with the right amount of chocolate took over five tries. My earliest attempts were far too strong! 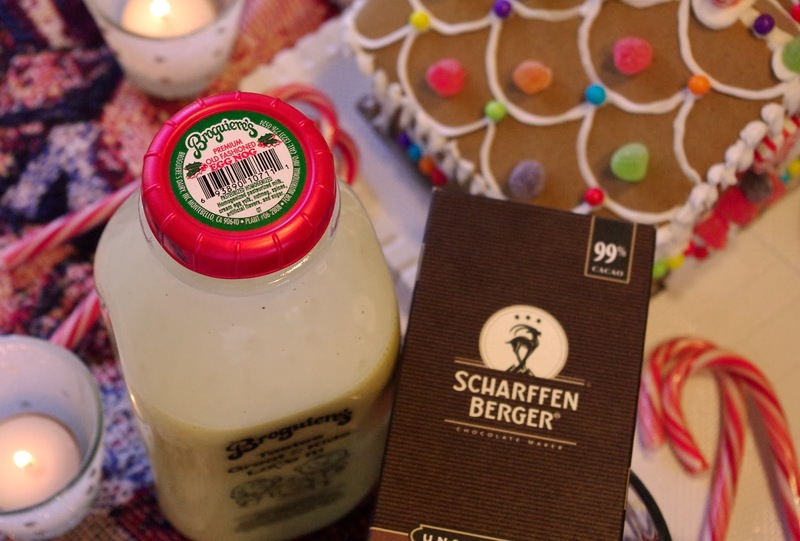 The picture above shows the basics of the gingerbread flavor. Pumpkin pie spice and clove, along with molasses. 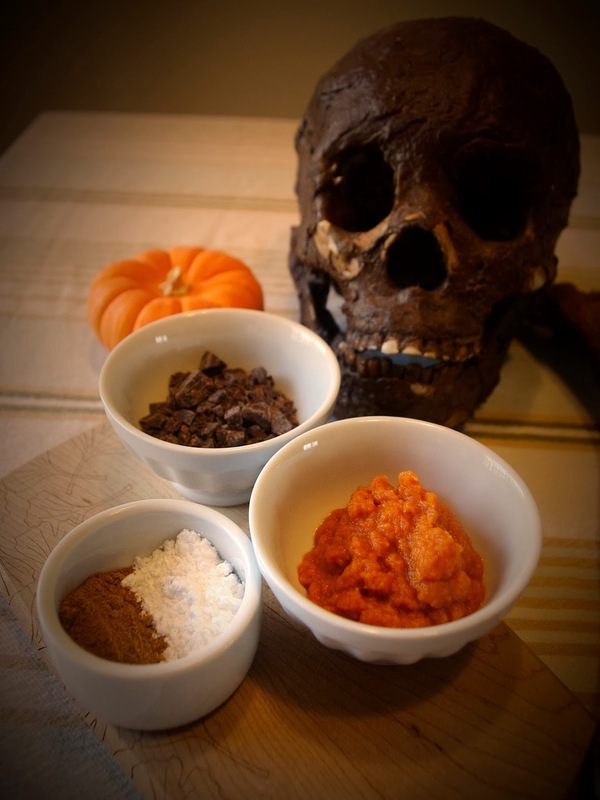 Pumpkin pie spice is simply a blend of cinnamon, ginger, nutmeg, and allspice. That's a lot of spices for a cup of hot chocolate! You'll see, it's totally worth it. Alternatively, you could use 1 cup of half & half and ½ cup of milk for a very thick, creamy version of this recipe. I tend to like the thinner version of this one. I'm using Lindt chocolate here. We need a strong, very dark chocolate to counter all the sweetness of the brown sugar and molasses. 85% works great, and I'm sure an 80% or 90% would be fine, as well. I'd steer clear of going under 75%, though. Or if you do, cut back on the amount of brown sugar proportionally. You'll have to do some taste tests to find the right balance. Molasses is a very interesting product. I didn't know where it came from until I bought some to use in recipes for this blog and researched it. It is the by-product of processed sugar. When sugar cane is boiled to create crystals, those crystals become table sugar as we know it. What's left behind is molasses. Well, actually it's called cane molasses. Once you boil it two more times, continually refining more sugar out of it, you end up with blackstrap molasses. 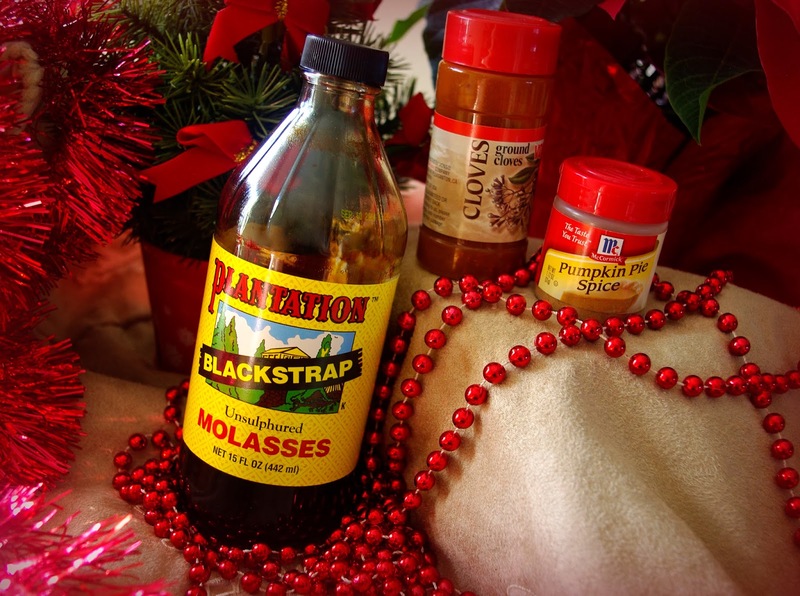 Blackstrap molasses is actually good for you! It's filled with calcium, magnesium, potassium, and iron, and one tablespoon provides 20% of your daily value of those nutrients. Awesome, huh? On that same note, brown sugar is simply sugar that hasn't been refined enough to be table sugar. The brown color is a result of there still being a bit of molasses left in it. In this recipe, you could use regular sugar, but using brown sugar just enhances that molasses flavor a little. Put the milk on the stove over medium heat. Once it's warm to the touch, add in the spices and the brown sugar. Let it get to just about boiling, then add in the chocolate. 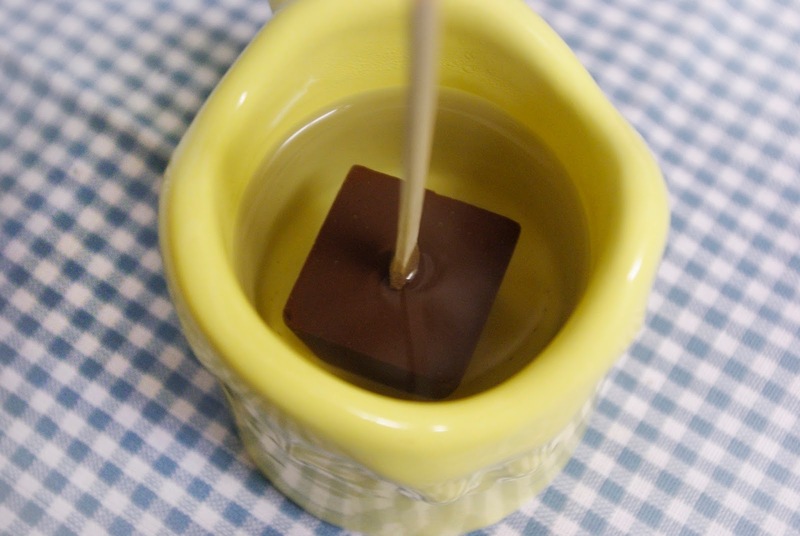 Once the chocolate is melted and incorporated, turn off the heat and add the molasses. Keep whisking it for a minute or so to be sure it's blended perfectly. Pour and serve. Amazing, right? 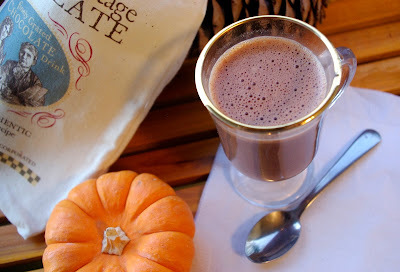 This is truly a great holiday hot chocolate. I'd advise against serving it with gingerbread cookies, as together, it could be a bit overwhelming. Try something milder, like speculoos or shortbread cookies. And don't forget, December 13th is National Hot Cocoa Day! 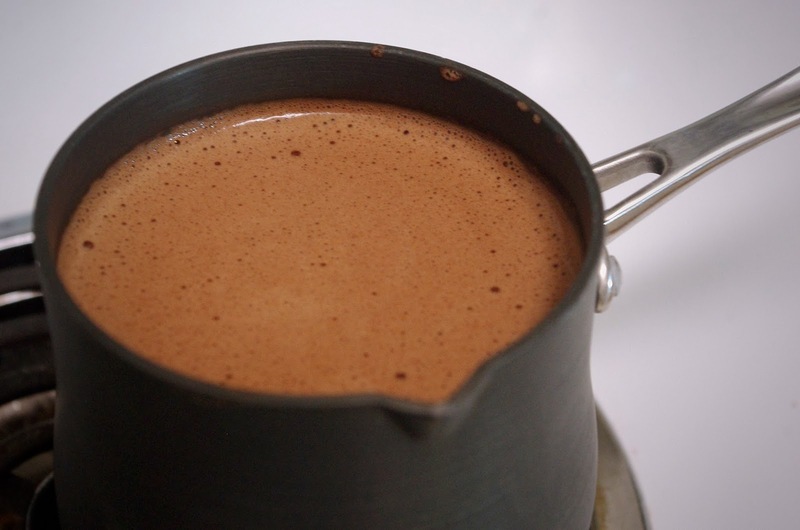 Celebrate it by not dumping a packet of cocoa powder and powdered milk into a cup of hot water, but by making a real, delicious, perfect cup of real hot chocolate. It's Thanksgiving time! Turkey, pumpkin pie, cranberry sauce, those mashed sweet potatoes with the marshmallows melted on top... Mmmmm.... The Pilgrims at Plymouth Colony probably loved those sweet potatoes with the marshmallows on top! Ok, ok, they probably didn't have marshmallows. Sadly, the Pilgrims didn't have chocolate, either. Reports online vary, but I've read that chocolate did not arrive in the American colonies until about 1670, when European chocolate was being sold in Boston. While Baker's Chocolate is arguably the oldest producer of chocolate in America, setting up shop in 1764, I also read that cacao beans were being imported into Boston as early as 1682. 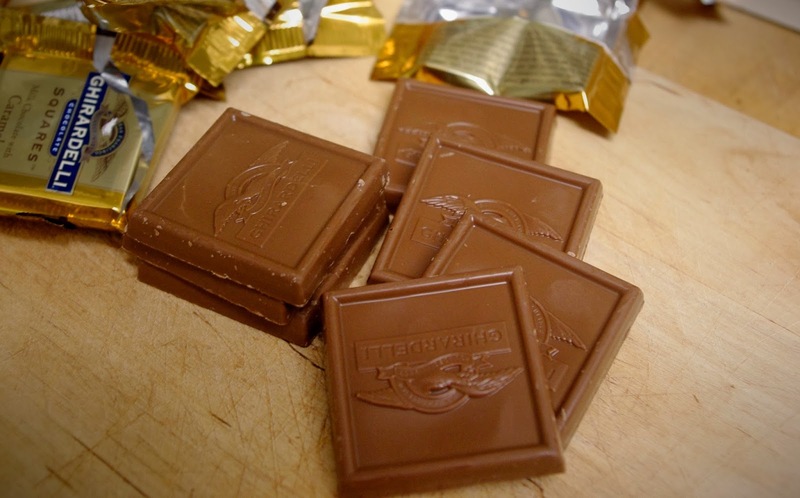 Benjamin Franklin was reportedly selling chocolate from his printing shop in 1735! So what is this I have here? 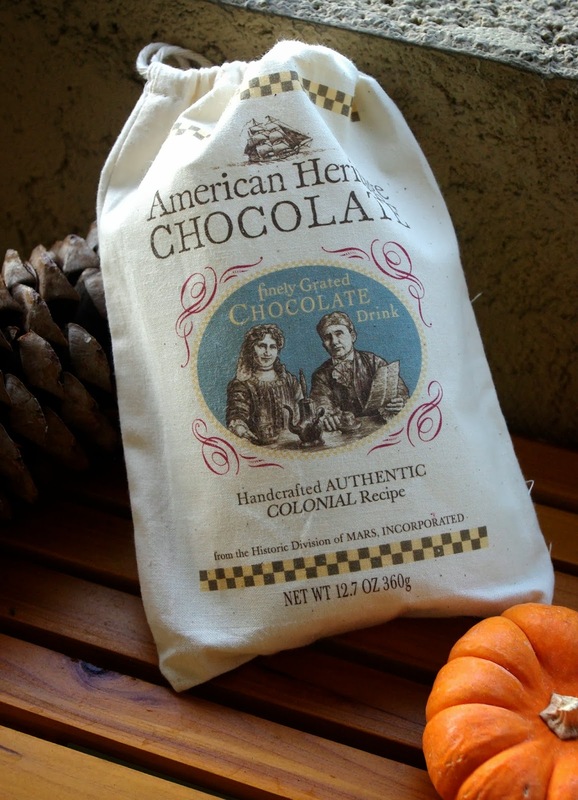 American Heritage Chocolate's Finely Grated Chocolate Drink. 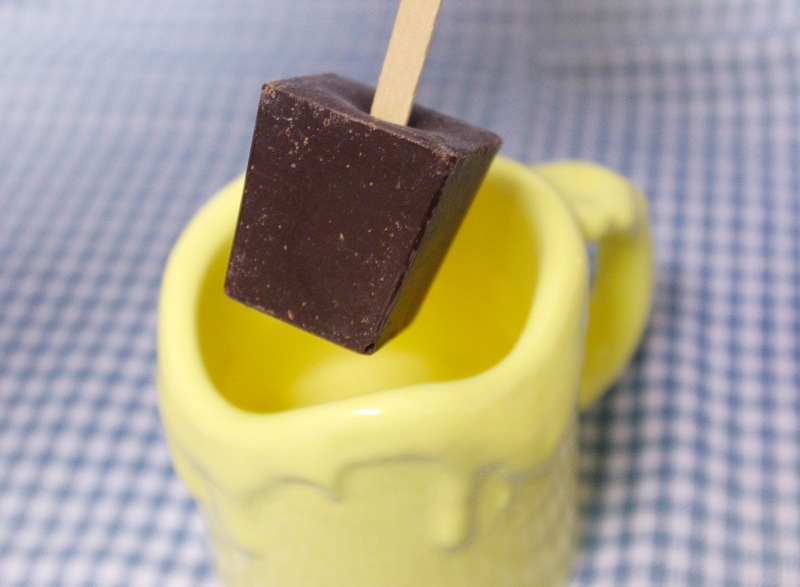 As I've mentioned before, chocolate was a drink long before it became an edible bar. This is hot chocolate as the colonists may have enjoyed it. It's a brand created by Mars (the folks who make M&M's and Snickers bars) using a recipe from 1750 and ingredients only available at that time in the United States. 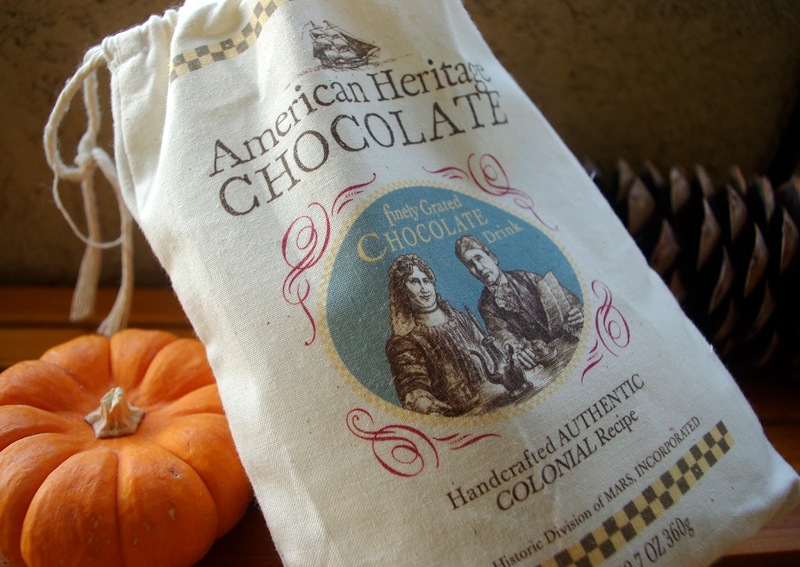 In keeping with the theme of being historically accurate and tied to America's founders, American Heritage Chocolate is only sold at museums and historic sites here in the States. Places like George Washington's Mount Vernon and Thomas Jefferson's Monticello. In fact, Washington served chocolate to guests of Mount Vernon from 1758 until his death in 1799! I bought mine from their website and had it shipped. If you go now, you'll notice the packaging has changed. When I got mine, it came in this cool little burlap bag. 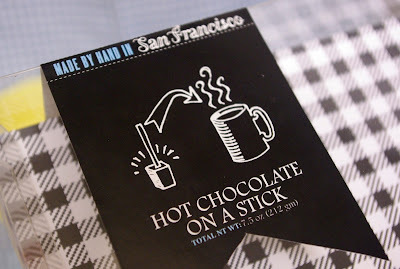 I had also purchased some chocolate sticks, and those came in a little burlap sack, too. Very cool! The new packaging is a canister. Not bad, but not as fun as the burlap bag! But what really matters is what's in the bag. It's not a powder mix but ground up chocolate, which is always preferable. It smells sweet and very much like cinnamon and vanilla. It's a very pleasant smell, and very different from other chocolates I've had, even though I've certainly had plenty with vanilla and cinnamon. The instructions say to make it with water. 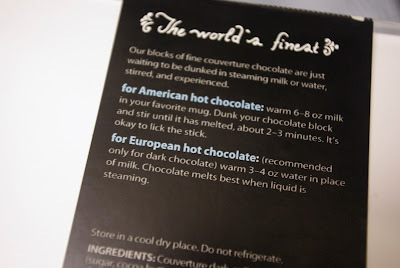 Water always lets the real flavor of the chocolate come through, so I stuck with the instructions. It's very good, definitely a distinct flavor, very tasty. It's easy to believe the colonials drank chocolate similar to this. Something about it feels very earthy. Maybe there's even a potpourri essence about it. Using the amount of chocolate listed in the instructions made this a rather thin hot chocolate, and a very small portion, only about half a cup. Out of curiosity, I went ahead and made another small batch with milk instead of water. This one was much more satisfying! Creamy and yummy, the milk was perfect with the flavors of the chocolate. While it may not be historically accurate, I much prefer it with milk. If you're a history buff, or maybe want to bring a touch of old time charm to your Thanksgiving, this is definitely worth checking out. It's also a great hot chocolate to have on hand for Christmas! Ok, buckle up. This one is going to knock you right out of your seat! After that strawberry hot chocolate just didn't turn out to be good, I felt like I should make amends for it. And believe me, this more than makes up for it! Salted caramel has been growing in popularity for the past few years. Even without the salt, this recipe is mind blowing! It's also one of the easiest. 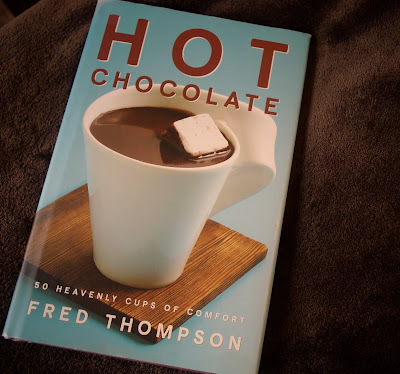 It came from a great recipe book I have, Hot Chocolate by Fred Thompson. The version in the book does not include the salt, however. The easiest thing about this amazing recipe is that we don't have to make the caramel or figure out what kind of chocolate to use. 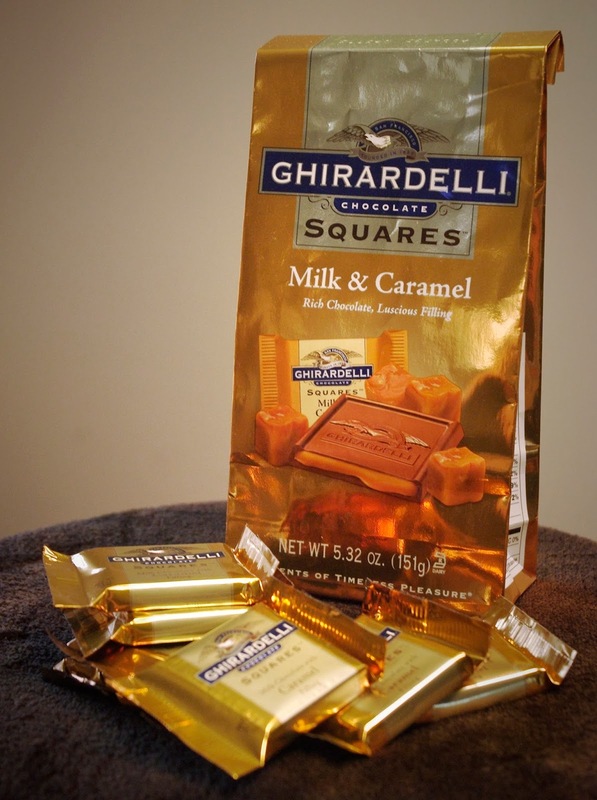 Ghirardelli has done that for us! They make a huge variety of single portion chocolate squares. 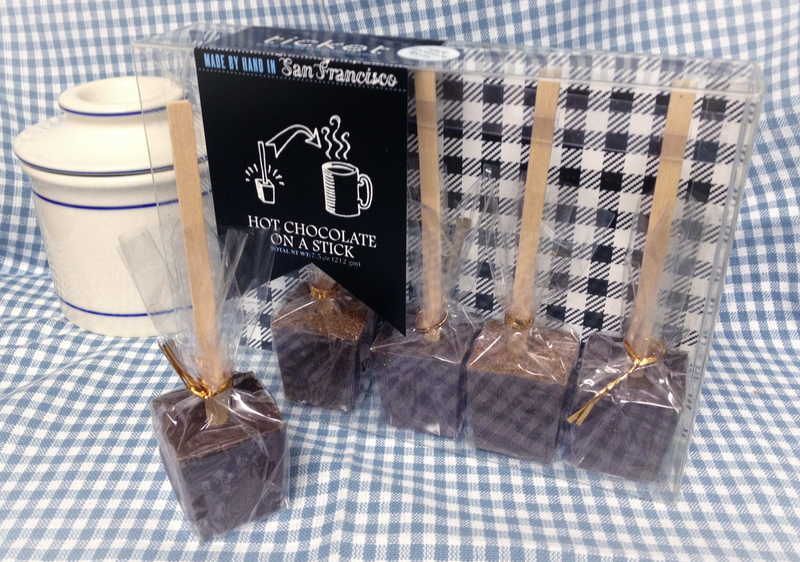 They're meant for snacking, but wow, do they make a good hot chocolate! Pretty easy list! 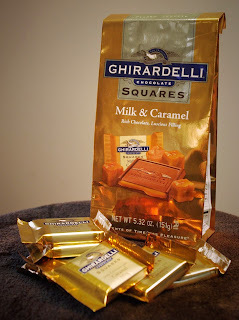 You should be able to find Ghirardelli squares at almost any grocery store or drugstore. Unwrap them and cut them all up. As always, the smaller the pieces, the faster and easier it melts. It's a little messier than our usual chocolate chopping, thanks to the gooey caramel inside. 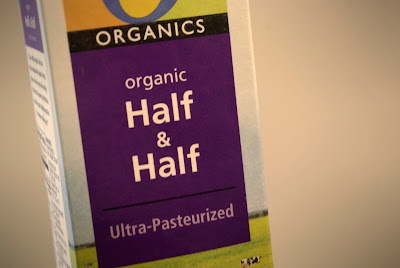 Instead of milk, we're using half and half. Half and half is 50% milk, 50% cream. It's thicker than milk, obviously, and definitely creates a much more textured and creamy hot chocolate. Heat up the half and half in a saucepan. Don't boil it, and keep stirring so it doesn't scald. Once you think it may be just about to boil, add in the chocolate squares. Again, because of all that caramel, it's going to be a little bit messier while you whisk it together, but eventually it all melts smoothly. If you decide you like caramel just fine on its own without the salt, then you are done. Grab a mug and pour! If you're going all the way, turn off the heat and add in the salt. Once you have stirred the salt in and given it a minute or so to dissolve, taste it. Not salty enough? Add a little more. Too strong? Add a little more half and half. 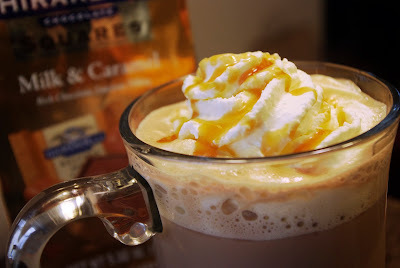 I topped mine with a bit of homemade whipped cream and a drizzle of store-bought caramel sauce, which I found in the ice cream section of my local grocery store. See?! Incredible, isn't it? I just had one of these, and now, looking at these pictures again as I write this, I want another. 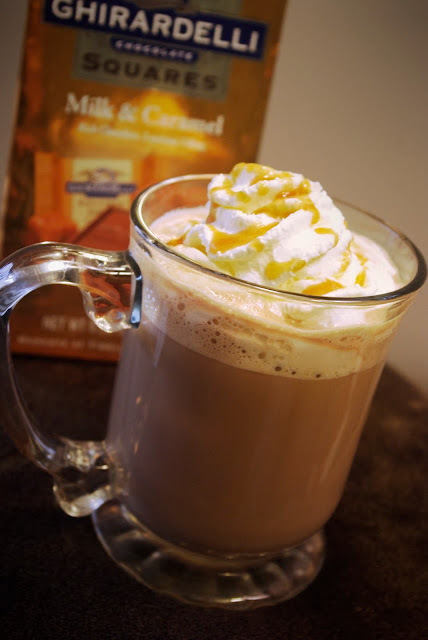 Insanely sweet and chocolaty, with the caramel and salt playing off each other just perfectly, it really is one of the best hot chocolates you can make. 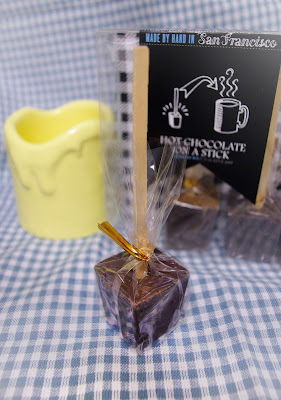 I'd love to do another in the future, using homemade caramel and a great artisan dark chocolate. I struggled a bit with this one. Not about making it - I was very excited to make it after seeing it on Giada De Laurentiis' daytime Food Network show Giada at Home. 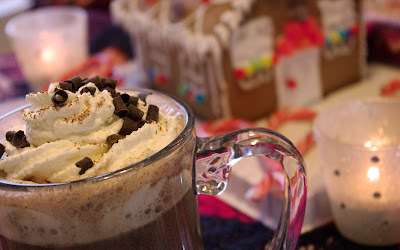 I took notes while watching the show, gathered the ingredients, took pictures as I went along, and finally took a sip of the completed hot chocolate. Hmm... It wasn't that great. It was barely good. So now what? I made this drink, my fiance had taken the time to help setup the beautiful pictures, and now this. I wanted my blog to only deliver top quality hot chocolates, the best I could find or think of, and this certainly wasn't that. I was going to scrap it. My fiance convinced me that I should post about it anyway. So please keep reading if you saw that episode of Giada's show and thought "Wow, that sounds yummy!" This sounded amazing when Giada made it on her show, and very healthy, as well. I think maybe that's more of what she was going for. Something healthy for the kids, something not filled with sugar and sweeteners. Some of these ingredients are new to the blog, so let's take a look at them. The base in this one, rather than milk or water, is almond milk. 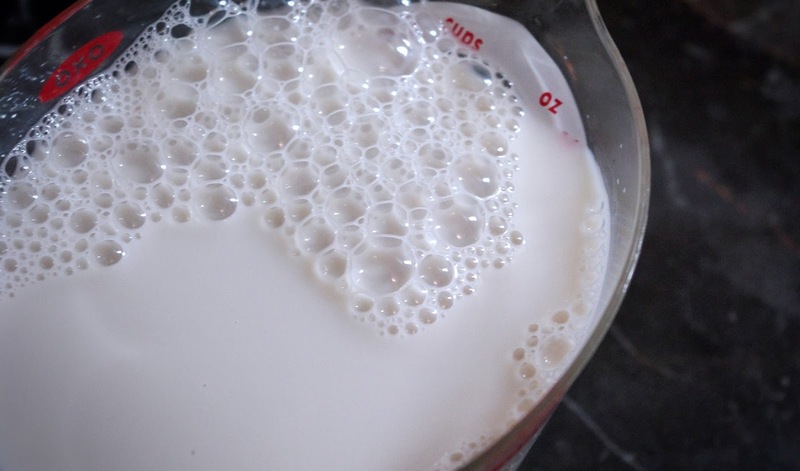 Almond milk typically comes in a few varieties: sweetened, unsweetened, vanilla, original, and combinations of those. Regular almond milk is made from almonds and water, with a few other minor ingredients, and it really does taste like almonds. It's pretty good. For plain drinking, I much prefer the sweetened vanilla flavor. 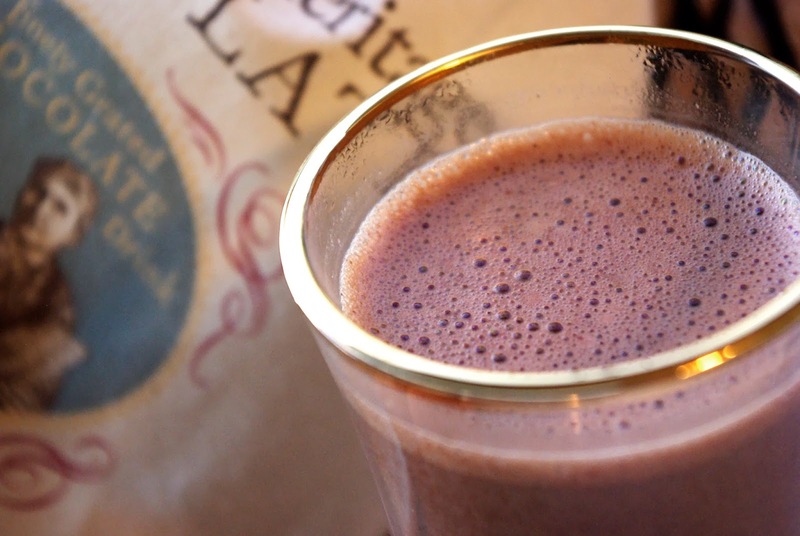 I plan on using almond milk in the future for dairy-free hot chocolate recipes. 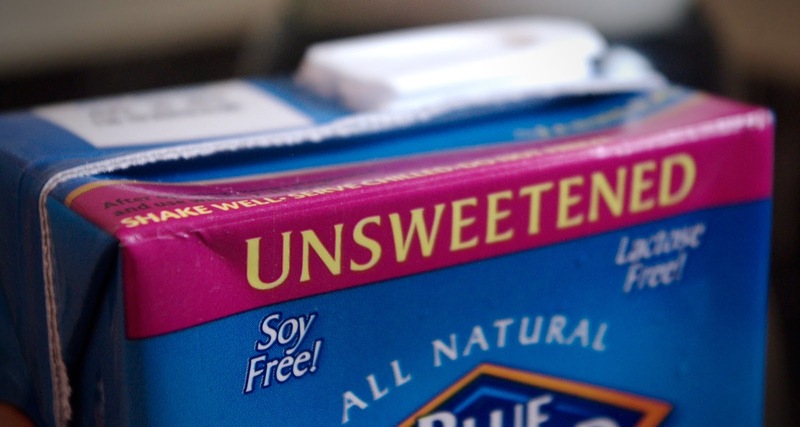 As a sweetener, Giada uses agave nectar. It tastes very much like honey, and has the consistency of maple syrup. 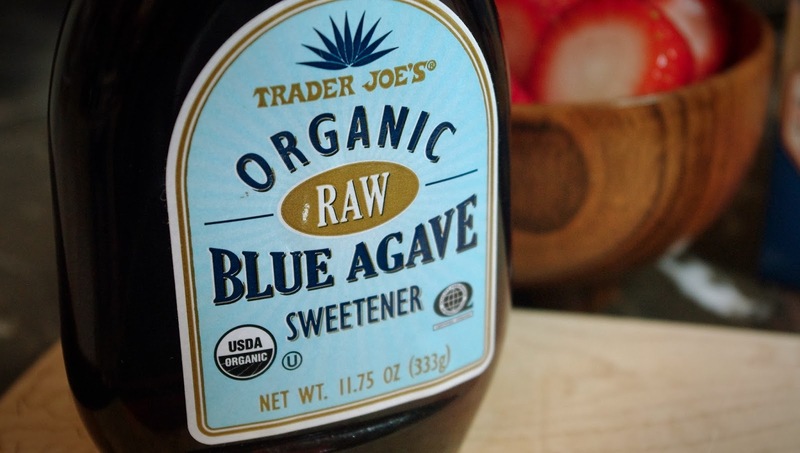 Pretty good stuff, but a little research online shows that while agave is being pushed as a natural, healthy sweetener, it is anything but. Many articles out there talk about how it is most definitely not a natural sweetener, and that the body processes it in the same way it does high fructose corn syrup. If this bothers you, definitely do some more research on it. There's tons out there. 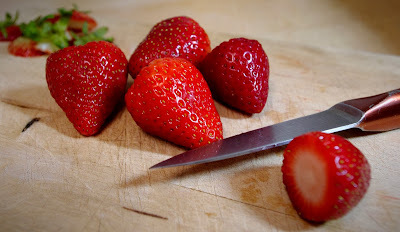 I'm using organic strawberries from a local farmer's market. Make sure you wash them good. Rather than rinsing berries under the faucet, a better way to wash them is to put them into a large bowl and fill it with water. Swish them around in it for a minute or so, then drain. That's a much more thorough washing! 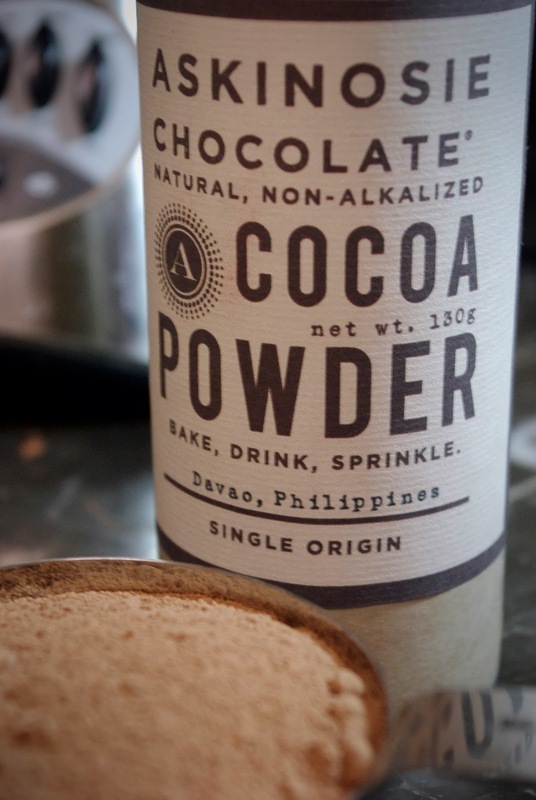 The cocoa powder I'm using is from Askinosie Chocolate. It's from beans grown in Davao in the Philippines. 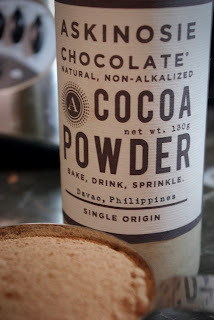 Askinosie makes amazing chocolate and chocolate products, and I reviewed their sipping chocolate a while back. The dark chocolate I'm using is some 70% from Scharffen Berger Chocolate. Great stuff! 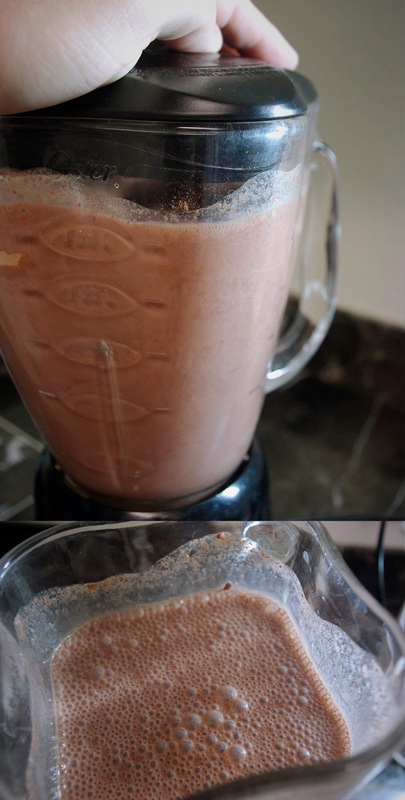 Cut all the green tops off the strawberries (discard those) and put all the ingredients into a blender. Blend until it's all liquid. This recipe makes a lot, so if you make it, be sure and have a small pitcher or some Tupperware handy to keep the rest in. And of course, keep it refrigerated. Pour it into a pan to heat it up. I'm only heating one serving. Don't let it boil, just get it close, and keep stirring while you heat it. 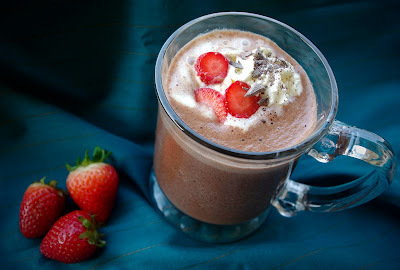 And there we go, Giada's strawberry hot chocolate. Topped with some fresh whipped cream, slices of strawberry, and chocolate shavings. What do you think? Do you agree with me, it's not that great? With all that being said, I think this is my opportunity to begin working on a strawberry hot chocolate of my own. 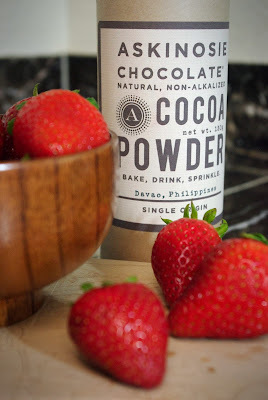 One that packs all the amazing chocolaty flavor it should, with tangy, sweet strawberry flavor not hiding in there, but sharing the spotlight. It's mid-October, and that makes it officially Fall. This is when the general population begins to really take notice of hot chocolate. 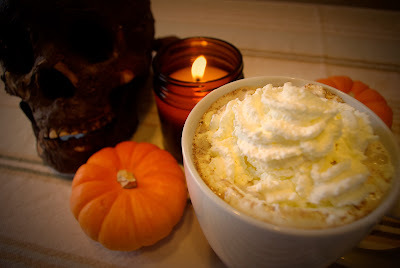 So, let's step up the game a bit and make a perfect cup o' cocoa for Halloween and Thanksgiving: some pumpkin spice hot chocolate! We're using all real ingredients, and we're going to make some amazing, perfect whipped cream again, but this time, instead of whipping it with electric beaters, I've got a new kitchen toy - a refillable whipped cream dispenser. If you don't have one, of course you can always do it with beaters or a whisk. But if you've got a little extra money and you make whipped cream a lot, it's worth it! 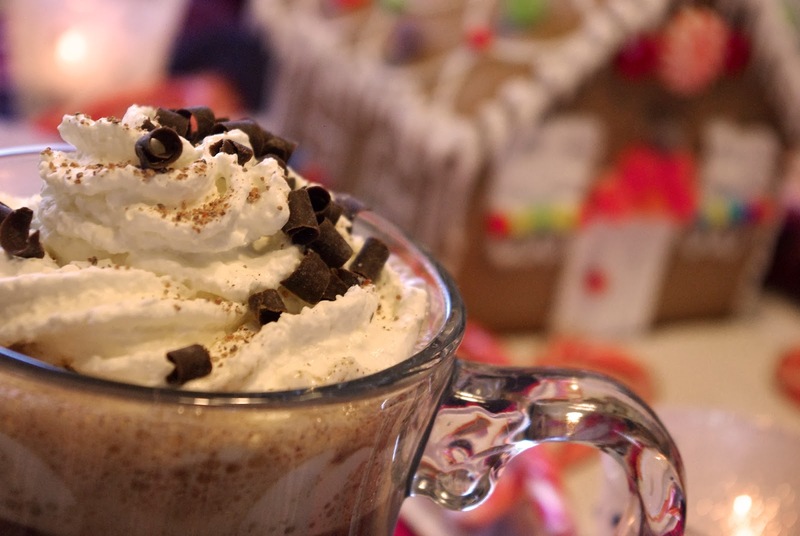 Let's make the whipped cream first, so it can chill while we make the hot chocolate. In the photo, you can see the dispenser. You also have to buy little carbon dioxide canisters with it. That's what pressurizes it once you pour the cream into the canister. 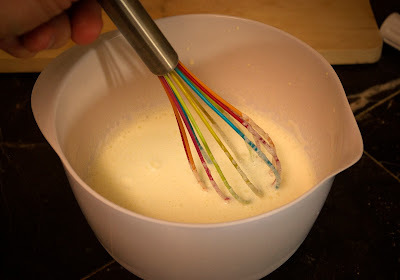 First we have to make sure the ingredients are mixed thoroughly before filling the canister, so pour the cream, sugar, and vanilla into a bowl and whisk it together for a few minutes, until it looks like the sugar is mostly dissolved. Pour it into the dispenser and screw on the lid. Now we have to pressurize it. Be sure to follow the instructions that came with your dispenser carefully. The first time we made a batch here, it didn't pressurize correctly and always came sputtering out every time we tried to use it. On the dispenser I have, the little CO2 can goes into a plastic holder, and then that holder is screwed into the lid of the dispenser. As you're tightening it, you can hear the carbon dioxide spray into the dispenser. That's it! Whipped cream is done! Shake it up lightly and give it a test, holding it upside while you spray. I do it over the sink, because usually that first bit is still liquid. 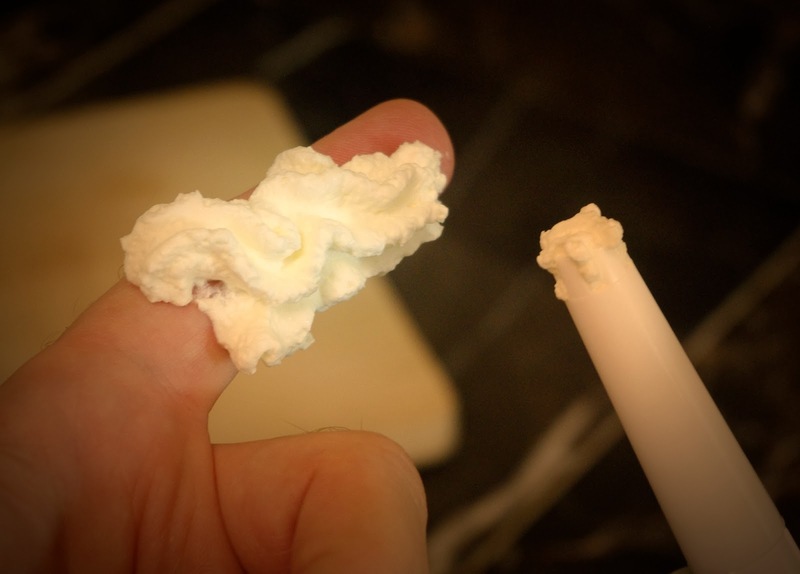 After a spray or two, you should have perfect whipped cream! Put that in the fridge so it stays nice and cool. Next we're going to gather up the ingredients for this amazing pumpkin spice hot chocolate. Real pumpkin puree, no fake pumpkin flavor here! And as always, the chocolate you choose will have a huge effect on the flavor. Anything dark (over 60%) should be okay, but when it's close to done, feel free to taste it and add more sugar if you'd like. I'm using ground vanilla rather than vanilla extract in mine. I like this flavor a little better; it feels a little more pure to me because it's not extracted with alcohol. 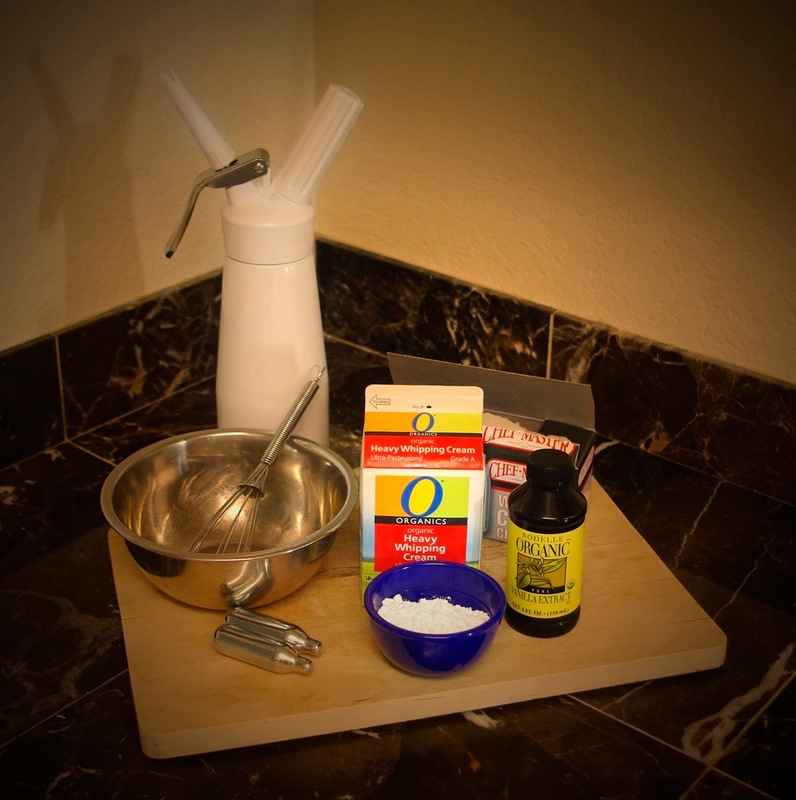 But vanilla extract works just fine, too, so use what you have. I'm using a really good chocolate, Varlhona Caraibe 66%. Varlhona makes an amazing variety of chocolates, and many bakers and confectioners use their chocolate in their own candy creations. 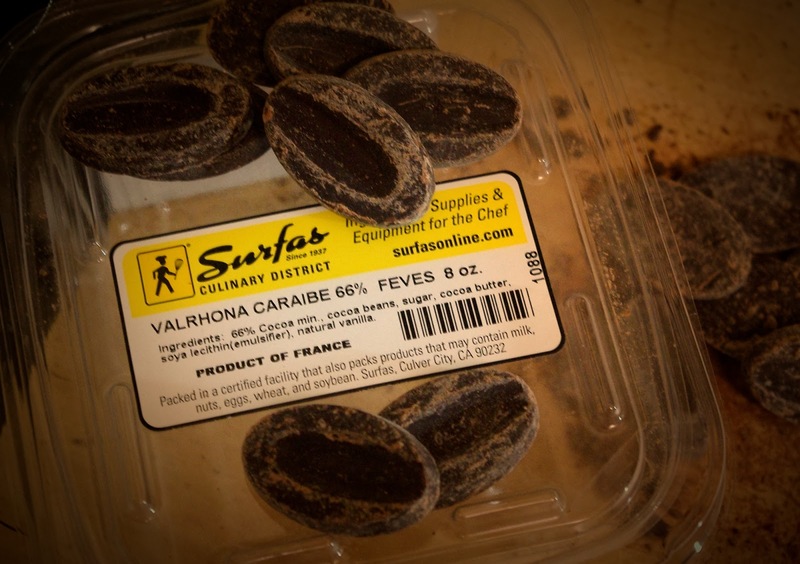 You can get Varlhona bars at most Trader Joe's, but for the baking portions, look for a restaurant supply store near your house. In Culver City here in Los Angeles, there's a great store called Surfas. That's where I got mine. 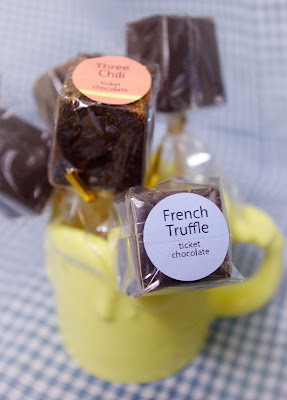 It comes in these great little bean sized bits that are perfect for measuring out for baking. 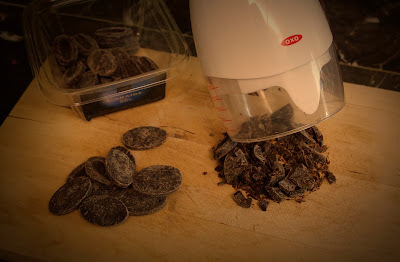 However, for easier melting, I prefer to chop up the chocolate even smaller, and that calls for another kitchen toy, my little Oxo Chopper. This gadget makes chopping almost anything really quick and easy! It's got a whole line of blades, and they rotate a few degrees every time they come down. Really slick! Kind of a pain to clean, though. 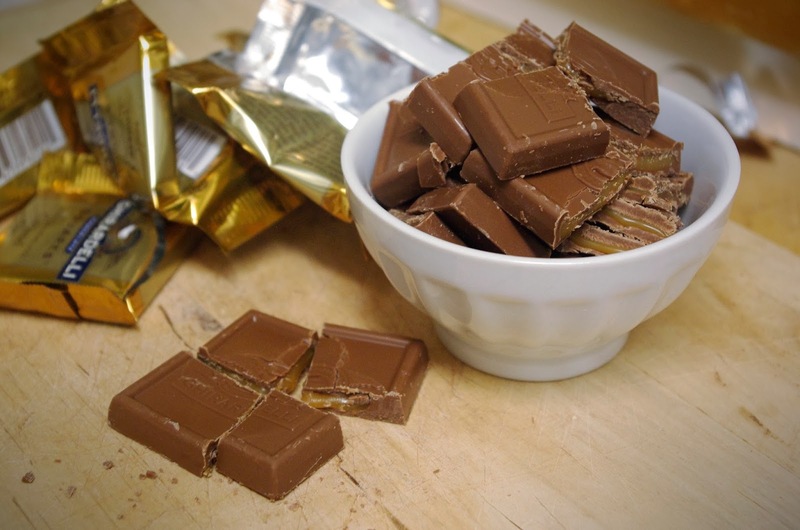 You should be heating the milk while chopping the chocolate. 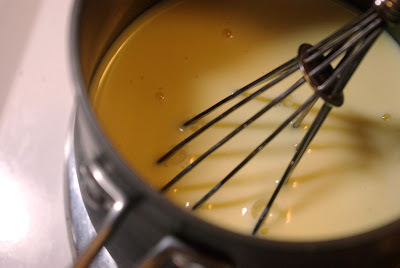 Once the milk is just about boiling, go ahead and add in the chocolate, whisking it around so it can start melting. 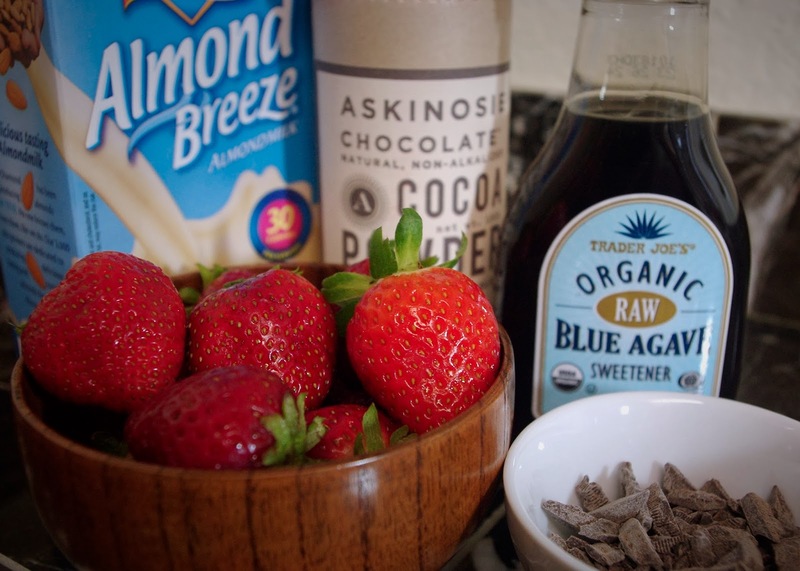 Once it's melted, add in the rest of these amazing ingredients. Take the time to smell it! It's wonderful! Pour it into a large mug, then carefully spray some of that awesome whipped cream on top. There's probably no better mug of hot chocolate for Fall than this one. Sit back and relax, put on a scary movie or a football game, and enjoy it.